Food Blogga: What is Kabocha Squash? You've seen it at the market. You've picked it up and wondered, What is this? An odd shaped acorn squash? Then you saw the sign: Kabocha squash, and thought, How the heck do you pronounce that? What is Kabocha squash? A relative newcomer to the US squash scene, Kabocha squash (pronounced kuh-boh-cha) is a hard winter squash available from late fall to late spring. Its hard, dull, bumpy dark green shell is marked with pale celery green striations. It's rather heavy for its size (usually 2-3 pounds) and has a stumpy grayish colored stalk. Kabocha squash has a brilliant yellow-orange flesh, like a pumpkin's. Both the texture and flavor of Kabocha squash is similar to a sweet potato: the soft, moist, fluffy flesh is surprisingly sweet and slightly nutty. 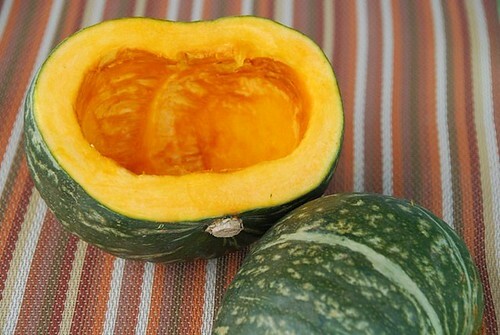 Kabocha squash is a centuries-old variety of Japanese squash that in Japan is often referred to as a Japanese pumpkin. Apparently it was brought to Japan from Cambodia by the Spanish in the 1500s and is used in dishes ranging from soup to sushi. As its rich orange flesh indicates, Kabocha squash is high in beta carotene, a powerful health-promoting antioxidant. One 3/4's cup serving of cooked Kabocha squash is only 30 calories yet provides 30% of your daily recommended vitamin C and a whopping 70% of vitamin A. It's also high in dietary fiber, especially if you eat the skin, which turns soft when cooked. Kabocha squash is so naturally delicious, that you could eat it simply roasted and unadorned. But why not have a little more fun? I created this recipe for Roasted Kabocha Squash with Orange-Honey Glaze a few weeks ago and can't stop making it. Roasting the Kabocha squash renders it irresistibly tender, while the sweet and spicy orange honey glaze enhances its inherent sugary goodness. The sprinkling of sunflower seeds adds just the right amount of crunch with a hint of smoky nuttiness. Preheat oven to 400 degrees F. Line a baking pan with tinfoil (for easy clean up). Brush the flesh of the squash with olive oil, and roast flesh side down for 30-35 minutes, or until tender. In a small skillet over medium heat, add 2 teaspoons olive oil. Add shallots and saute until lightly golden, about 2 minutes. Remove from heat. In a small bowl, combine remaining ingredients EXCEPT sunflower seeds. Whisk until smooth. Just before you're ready to serve the squash, add the sauce to the pan of sauteed shallots. Heat on medium until the sauce begins to bubble and becomes lightly syrupy, about 2 minutes. Remove from heat and drizzle over the cooked squash. Sprinkle with sunflower seeds. Serve immediately. Note: Kabocha squash is available in organic markets such as Whole Foods as well as many traditional supermarkets. If you can't find Kabocha squash, then acorn, butternut, or buttercup squash make good substitutes. Wow, you always have such informative posts! I knew nothing about this squash before. Now I'll have to go search one out. The recipe sounds delicious! I'm going to have to keep an eye out for this. I wonder if they have it at my local Japanese grocery. I bet it would make for a terrific lunch when paired with a salad. I received one of these babies in my organic box (like a CSA) last year, and since that day it's been my favorite squash! It's the smoothest and sweetest squash I've tasted so far. I'm sure this glaze only makes it better! Mmm, this squash sounds delicious! Thanks for the lesson. Now I can't wait to make this recipe. I love this, I made a great potage with it. It was delicious. Great post. Love all the flavors you've got in the glaze... sounds yummy! I picked one up last week at the Asian grocery store, they are pretty common in Brazil, also brought by the Japanese many decades ago. I roasted along with oregano and garlic, and then baked in a pizza/flatbread. Nice post about kabocha! I like to pick them up whenever I can find them. I looked for these last fall and couldn't find any in our area, so I've been on the hunt for some seeds to grow them in our garden. Your orange sauce sounds lovely! mmm. nick and i really enjoy kabocha squash. your glaze sounds lovely! Coincidence – I just finished eating dinner made with kabocha! I diced it up and made a white chili. Love that you don't have to peel it. I think that's the squash we commonly get in Manila, and always what I use whenever you guys call for squash :) Glazing is such a classically delicious way of cooking it! another wonderful, naturally gluten free recipe! Thanks for the most informative post. Pity we can't get these in Greece. I cook kabocha regularly and I still learned something new from your post. I especially appreciate the nutritional info. Thanks for the link back! mmmmm... sounds yummy! Thanks for the link! You're right. I have been wondering what it was and how to prepare it. Looks great! I'm glad you're out there checking this stuff out. As you say, I always thought it was an odd batch of acorn squash! I will give it a second look. Your posts always are so info packed... love them! sounds yummy...what a great and healthy recipe...I love the variety of food that you share on your site...Uphere in U.S. i always have a hard time trying to find ingredients...one of my friend introduced me to a great resource www.myethnicworld.com and i thought i pass great along as well. You know - you can make ANYTHING look good! Oooh, that glaze would work well on a lot of sweeter squash like this. Great! I live in Japan and can't get regular pumpkin and tried kabocha in pumpkin pie, bread and muffins. Tastes better than pumpkin. Susan, these photos of the squash are so yummy looking. I love freshly roasted squash. Delish! I actually HAVE seen this and wondered! It looks great though and I think they still have it at my favorite corner market. Thanks for sharing the great idea! Orange and honey and a little bit of spice...delicious combination for squash! :) I haven't come across that squash here but I'll keep an eye out! Those are new to me, perhaps I've seen them at the store, though never tried.. Thanks for the info! kabocha is my favorite food, EVER! too bad ppl don't know much about it, so it's kinda tough to find in the grocery stores! it can be found easily in asian supermarkets, though. thanks for this great post and letting it known to the public! Really nice Susan. I am always looking at ways to expand my vegetable universe. This delivers. I've seen these, now I can buy one and know what to do with it! 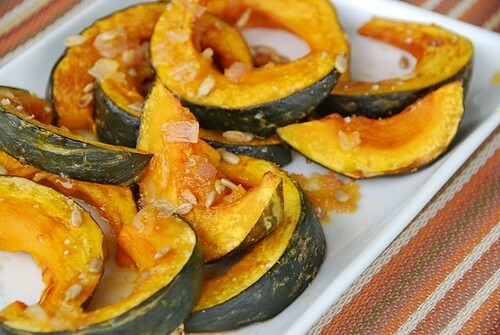 This looks really good and since I love butternuts and acorn I'm sure I'll love this squash too! I can't believe I'm actually craving squash now... You have a gift Susan! This recipe is making my mouth water. Great job! I love kabocha squash, it's got such a wonderful, rich flavor. How can one tell if the squash is over-ripe? I just steamed one and a found tiny white "balls" among the seeds. Any explanation for the white particles? Thanks for sharing this info & recipe. I just got a kabocha squash in my co-op box and I'd never before seen nor heard of it so I had no idea what to do with it. anonymous-I'm glad to be of assistance. You'll love it! I believe it rhymes with "mocha". So instead of the pronunciation you gave, this would make it pronounced, kuh-BOH-kuh.